காவேரி தீரம் அமைதி கொண்டு விளங்கிற்று. உதயசூரியனின் செம்பொற்கிரணங்களால் நதியின் செந்நீர்ப் பிரவாகம் பொன்னிறம் பெற்றுத் திகழ்ந்தது. அந்தப் புண்ணிய நதிக்குப் 'பொன்னி' என்னும் பெயர் அந்த வேளையில் மிகப் பொருத்தமாய்த் தோன்றியது. சுழிகள் - சுழல்களுடனே விரைந்து சென்றுகொண்டிருந்த அந்தப் பிரவாகத்தின் மீது காலை இளங்காற்று தவழ்ந்து விளையாடி இந்திர ஜால வித்தைகள் காட்டிக் கொண்டிருந்தது. சின்னஞ்சிறு அலைகள் ஒன்றோ டொன்று லேசாக மோதியபோது சிதறி விழுந்த ஆயிரமாயிரம் நீர்த்துளிகள் ஜாஜ்வல்யமான ரத்தினங்களாகவும், கோமேதகங்களாகவும், வைரங்களாகவும், மரகதங்களாகவும் பிரகாசித்துக் காவேரி நதியை ஒரு மாயாபுரியாக ஆக்கிக் கொண்டிருந்தன. அறையில் பூண்ட உடைவாளும், கையில் நெடிய வேலாயுதம் தரித்த ஆஜானுபாகுகளான மெய்க் காவலர்கள் மன்னனின் அருகே கம்பீர நடை வந்தனர். கணீர் என்ற குரலில் மன்னனை வரவேற்கும் கட்டியம் ஒலித்தது. ராஜாதி ராஜ - ராஜ குல திலக, வெற்றி திலக, மார்த்தாண்ட, ராஜகம்பீர, சோழ மண்டலாதிபதி மாமன்னர் வீராதி வீரர் ராஜராஜ சோழன் வருகிறார் - பராக் ! பராக் !! The Royal Entry, is a much celebrated one – traditionally in many kingdoms of South India as also in various parts of the globe. The entry of the monarch followed ceremonies and festivities according rousing reception to the ruler. Often the entry would centre on a procession carrying the King on a high pedestal, on adorned elephant or horse. The first visit by a new ruler was a great occasion for celebrations calling for lavish displays of pageantry and propaganda. Thanjavur witnessed it much recently ~ a moment of joy for the subjects ..
History has pages devoted to Aditya Karikalan, the Chola prince, born in Tirukoilur and was the eldest son of Sundara Chola. He was the elder brother of Rajaraja Chola I and Kundavai. He led the Chola expedition against the Pandyas and defeated the Pandya king Veerapandyan at the battle of Chevur. He killed Veerapandyan after chasing him on the banks of Vaigai river. Aditha was the co-regent and heir apparent to the Chola throne. He was to die later getting killed by a plan of his enemies. By some accounts, the inquiry into the death was completed in the second year of Rajaraja Chola I's reign and the lands of officials involved were confiscated. His death remains a mystery in Tamil history. During that period Chozha kingdom thrived – it extended to areas outside the present day Tamil Nadu – around 993 AD Ceylon was invaded with King Rajaraja Chozhan conquering the Anuradhapura Kingdom. The island was to become a province of the vast Chola empire during the reign of his son Rajendra Chola. The Chola rule lasted for eight decades in the island, later was overthrown in 1070 through a rebellion led by Vijayabahu I one of the dispossessed Sinhalese monarchs. The King ~ Emperor - Raja Rajan was born in 947 AD in Aipassi month on the day of Sadhayam nakshathiram. He was the third child of Parantaka Sundara Chola and Vanavan Maha Devi of the Velir Malayaman dynasty and was named Arulmozhi Varman. After the death of Aditya Karikalan, Sundara Chola announced that Uttama Chola will succeed him to the throne. Arulmozhivarman ascended the throne after the death of Uttama Chola in 985. The Thiruvalangadu copper-plate inscriptions state that Raja Raja was elected through a democratic process followed by the Cholas. Raja Raja was crowned and hailed as Raja Raja literally meaning "King of Kings". Of his many conquests – an interesting one was the naval conquest of the islands of Maldives. The realization of the importance of a good navy and the desire to neutralize the emerging Chera Naval power were probably the reasons for the Kandalur campaign in the early days of Rajaraja’s reign. 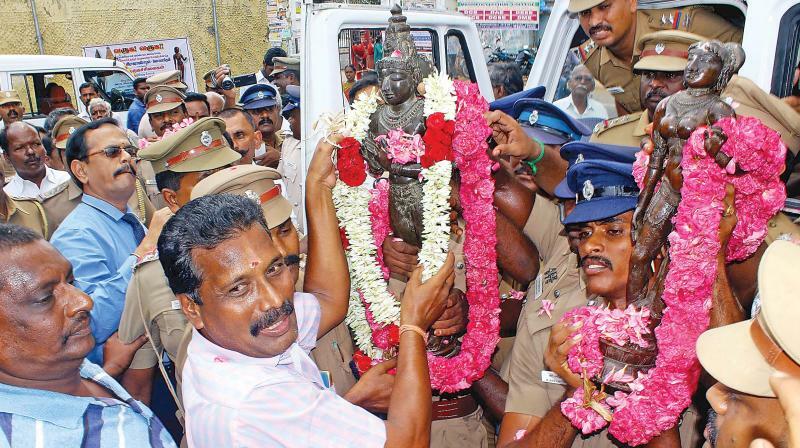 It was a reverential home coming for the two icons of King Raja Raja Chola, who built the Big temple at Thanjavur and his queen Lokamadevi, when they were brought by Idol wing police headed by Pon. Manikavel, IG, to the court which deals with idol theft cases at Kumbakonam on Friday, 1st June 2018. People gathered in large numbers and welcomed the icons by shouting “Raja Raja Chola Vaazhga” when they were brought by the police at Bhakthapri rountana at Kumbakonam for presenting before the court. Members of Federation of All Traders Associations, Kumbakonam, Thenbharatha Kumbamela Trust, Jyothirmalai Iraipani Thirukudam, Viswa Hindu Parishad, Hindu Makkal Katchi, Pandanallur “Engal Oor Engal Perumai” trust and AIADMK gave a reverential welcome to the icons. They garlanded them and ‘Sivanadiyars’ played ‘Sivabhoothaganangal’ musical instruments like drums and conch. After the icons were produced before additional magistrate court, the judge saw the icons and ordered the idol wing police to hand over them to HR & CE department. Mr. Bharanidharan, Assistant Commissioner of HR & CE took possession of them from the police. Later, the judge ordered that they be placed at Big Temple after which the icons were taken to Thanjavur via Thiruvaiyaru. The icons were taken to Thiruvaiyaru where Lokamadevi had built a ‘Vadakayilayam temple’ and later brought to Big temple here and placed there late in the evening. 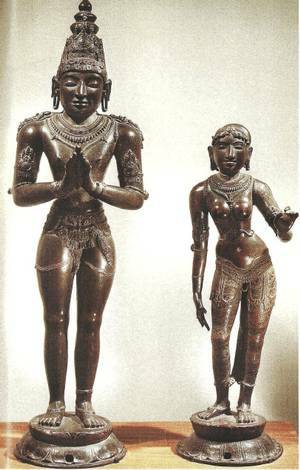 The two icons, in a posture of worshipping Lord Brahadeeswara, for whom the king built the Big temple, were believed sculptured and presented to the temple even when the king and queen were alive 1,000 years back by the king's lieutenant Senathipathi Mummudi Cholan Brahmarayan. Mr. Pon. Manickavel said that investigation was continuing and those, “whoever may be and how old they were”, (even beyond 100), allegedly involved in the theft would be brought to book. Action would be taken against Sarabhai Foundation, Calico Museum at Ahmedabad, he said. Mr. T. Senthilkumar, SP, Thanjavur district, said six armed police men will be on duty in shifts 24x7 at the Big temple for the icons. The icons were brought by the idol wing police who went to Ahmedabad after documents were presented to the museum authorities, officers said. The icons were allegedly stolen 50 years back and the FIR had been filed on the missing icons by Mr. Pon. Manickavel. A case was registered in March this year and a breakthrough achieved in three months, police said. The icons were later taken in procession on a flower-bedecked ‘rath’ around the ‘prakara’ of Big temple after their arrival here on Friday night. The icons were brought before Lord Brahadeeswara at the sanctum sanctorum and aarthi performed. They were then placed near ‘Kannadi Prabhai (mirror arch)’ at ‘Arthamandapam’. Hundreds of people had darshan. ~ and amidst shouting ‘welcome to Emperor Raja Raja chola’ we are inclined to shout from the bottom of our heart ‘thanks to Mr Pon Manickavel’. Hats off to you Sir and you are our real hero !